For a few months I’ve been wanting to get out to Russell, KS to visit Auto Artistry. I first found out about this shop from Doug Reed who’s Toad (49 Oldsmobile Kustom) had been reworked at Auto Artistry. Finally last Saturday I got the chance to make the trip out to Russell. Auto Artistry has a range of projects in progress and on display finished. That’s one kool remote control valve cover. With a new grandkid freshly arrived, Auto Artistry’s boss Mike Schoech brought on a new project to start working on. This beautiful ride was in the shop to be swapped from air ride back to static suspension. Here’s the project gallery on the car. The 57 Ford Pickup project and the 66 Chevelle project. This custom aluminum radiator setup was ready for duty in the 57 Ford pickup project. New K Member and 6.1 Hemi are on the list for this Cuda project. Watching this Chevy come together will be fun. Keep tabs on it here. The shop truck is getting the full on treatment, expect to see 1 bad Mopar 4×4 in a couple of months! See the progress so far here. This beautiful 37 Ford was originally in for a factory restoration, after awhile of driving it that way the customer decided they wanted a bit of an update. If you want to this blog in your email inbox each time the blog goes live, go on up to the top right hand corner of the website and enter your email address. The last day of each month I randomly pick 1 subscriber to win a prize package. 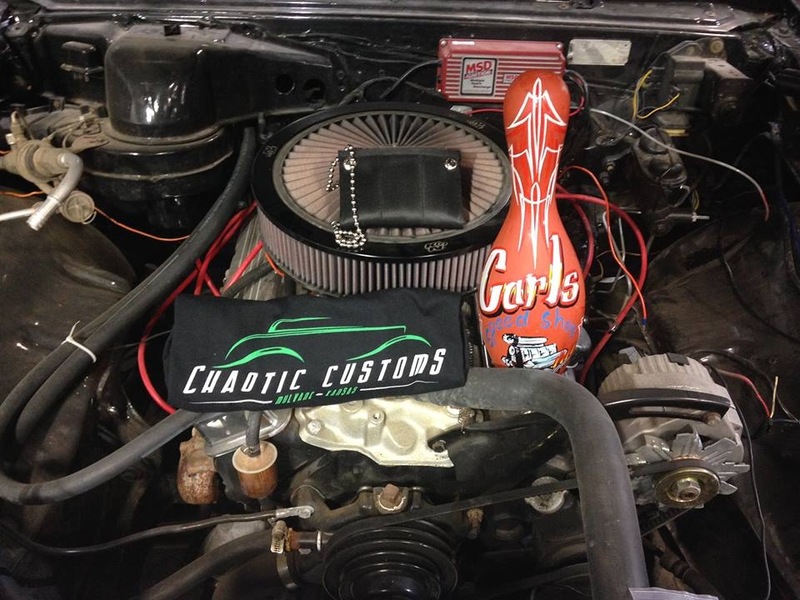 This month’s prize is a kustom art piece from Chaotic Customs (shown below), a Royboy Knit Winter Hat & a shirt from Stray Kat Kustoms! $1000 Up For Grabs! Click the link for more info! Thank you to the first 2 sponsors of my site, quite frankly the only 2 that I’ve asked to sponsor the site so far. If you’d like to help sponsor Royboy Productions and provide the koolest car show coverage to folks worldwide, click here to ask me about it.